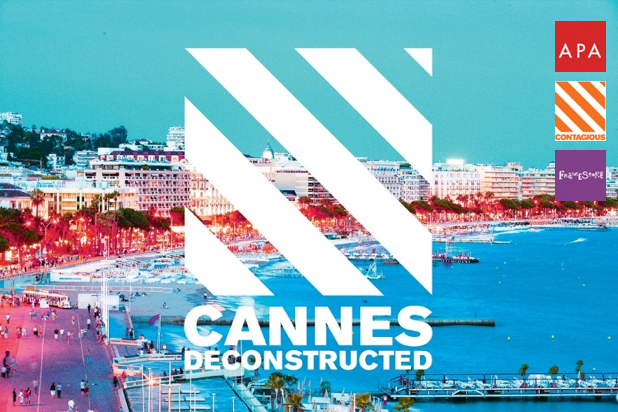 Together with Contagious and Framestore we are bringing you Cannes Deconstructed at 6.30pm on Tuesday 9th July. It is a 90 minutes presentation from Contagious as to the most interesting future trends they identified at Cannes Lions. Contagious have been presenting Cannes Deconstructed for advertising agencies for some years and they are popular as the best way to catch up on the best learning from Cannes. It is a great opportunity to learn for everyone who did not have the opportunity to attend the sessions in the Cannes Palais and part of our work to present APA members with accessible ways to keep up to date with future trends and opportunities.